Inspired by the bounty of fresh produce picked up through our CSA last year, as well as the convenience of a few different veggies such as lettuce or peas being grown in our landlady’s veggie garden (she said we could help ourselves; she wouldn’t be collecting it all), I’m planting the garden again this year with a variety of items. I started many of the seeds early, indoors, and have just recently been getting coordinated enough to transfer the hardy stuff outdoors, as well as plant the cold-tolerant items. 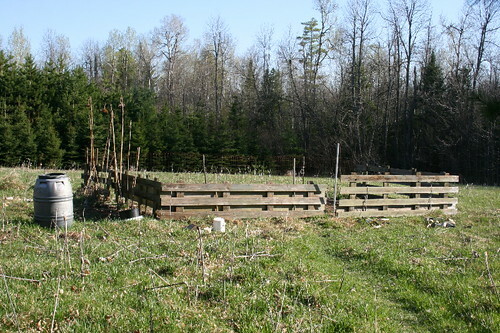 First things first: I had to get a fence up around the perimeter of the 350 sq ft space – not so much to keep the deer or rabbits out (we had no trouble with either last summer) as the dog (who doesn’t stop her mad gallop where the trail ends, and is happy to dig, too, if you are). It took a while to find the time to get this done, as it required a full afternoon. Finally, the fences went up last week, using odds and ends we found around the sheds. With the perimeter established, I could move on to the actual ground prep. The delay in getting started allowed some other critters to take up residence first. As soon as the ground had thawed out and was warm enough to dig in, I started seeing bees buzzing about the sandy plot, low to the ground. I knew what they were, from having encountered something similar last spring: they’re mining bees, family Andrenidae, probably genus Andrena. 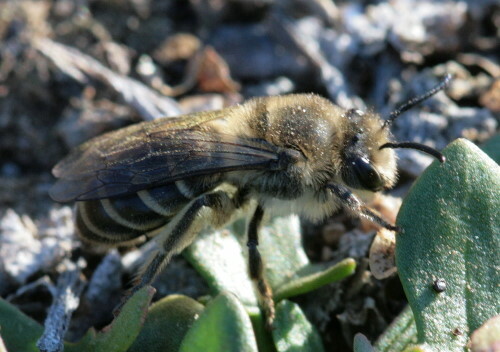 Although there are many different species of mining bee, which will fly at different times of the year, most of this genus are active in the spring. Probably most or all of the bees in the garden plot are females, busy working on nest sites. The bees are solitary, meaning each female builds her own nest without help of others, and provisions it herself. The fact that there were literally dozens of them in this small area is simply because they need exposed soil in order to start digging their nest. This doesn’t have to be a large expanse; I saw a few bees digging in tiny thumb-sized bits of dirt out in our lawn, too. But the garden, having very little vegetation, was really an ideal location. 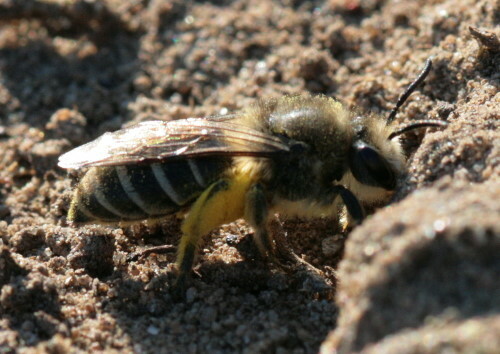 The female bees pick out a spot and start digging tiny tunnels into the soil. These are usually branching, and each branch ends in a small chamber where the female lays an egg. She’ll then provision the egg (or, more accurately, the larva, once it hatches) with pollen and nectar that she’s collected up from spring wildflowers. You can see all the pollen clinging to the hairs on the legs of this bee as she heads back to the burrow she’s dug. She may need to make many trips to fully provision her burrows. Once a cell has both egg and pollen she’ll close it off, and the larva is left to develop on its own over the summer. At one point, as I was sitting and waiting for somebody to land and stay still long enough for me to take a photo or two, one bee swooped down and landed on the one I was stalking. I only got one quick, blurry photo, unfortunately, so it wasn’t completely clear what was going on here. A male arriving to mate with a female? One female expressing displeasure at the presence of another? Disputing a land claim, perhaps? Unfortunately, I needed to rake out the ground to prepare it for planting. Weeds had grown up since the end of the last growing season, and the earth needed to be loosened a bit after the packing from the winter snow. I was terribly reluctant to dig up all these burrows the poor bees put so much work into, but really didn’t have any option about it. They’re very docile bees, however, and I found I could wander about the garden setting up the fence and, later, starting to work the ground without them getting too worked up about it. 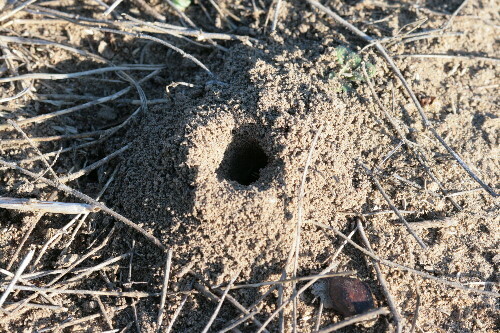 Solitary bees and wasps find their burrows using landmarks such as twigs or tufts of grass, and if these are removed or moved they become completely disoriented. A lot of the buzzing about I observed (before working the soil) was the bees arriving and looking for their landmarks to orient themselves to their burrow. I felt very badly for raking over all their hard work, and it was sad to see them come back and zig-zag back and forth over the area where their burrow used to be, looking for the landmarks that I’d since removed. I think, however, at least some of them started new burrows since I found fresh holes in the raked soil the following day. Next year I’ll have to go out and get the garden prepared earlier in the season so they can start their digging after I’m already done. Great pics! I’ve been fascinated by Adrena lately, too. And I’ve been tempted to plant early stuff, like peas, but the snow over the weekend reminded me that it is still a little too early (although peas are pretty hardy). These are beautiful shots. 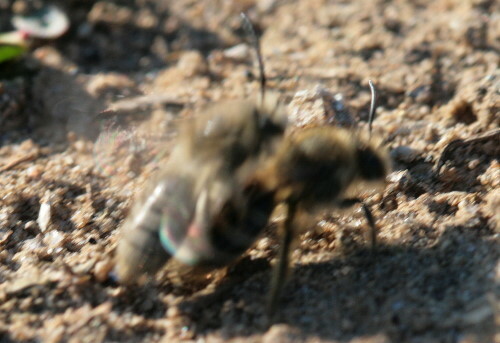 Though it’s fuzzy, I’m most intrigued by the two bees together. I’d love to know what that was about. Well, at least they’re welcome to come back to the garden now that it’s prepped. And you know to hit the dirt earlier next year. Poor critters. I know what you mean. No matter how many worms are in the clumps of dug-up soil, I still feel bad if one accidentally gets sieved. Nice job on the fence! We’ll have to add something around our raised beds because of my sometimes inaccurate bouncy-ball pitches. Impressive shots, I know these bees don’t like to sit still and pose. 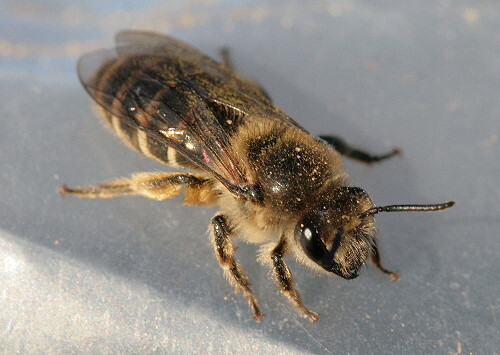 Do you know how I can tell an Andrena from a Colletidae? Are you sure the raking/loosening of the earth will be more beneficial for the garden than trying to keep the resident pollinators comfy? I’m not sure how much stress it is to be re-digging your home. I am new here, but will certainly come back more often. Very nice pictures of the bees, many more interesting posts around, brilliant! For two years I have searched and searched for pictures of the bees burrowing in my front garden. Finally, I found you! While I realize that these bees are an important part of mother nature, they are taking residence right next to my front door flower garden… I hate to disturb them and want to get rid of them, but every time the front door is opened, I fear that some will find their way into the house and cause problems. I am highly allergic to bees. A few years ago a woman in my neighborhood died due to bee/wasp stings! Is there anything that I can use to deter them from using that one flowerbed? HELP! Not all bees sting and of the solitary ground burrowing bees that do sting it happens extremely rarely and the sting is feeble. Wasps are a different story, you can’t group the two together. Chances are if you have bees nesting in your flower bed you have more reason to be happy than to worry. I still got stung on my first encounter with them. Not a good way to make friends. how do you kill these pesty insects?